On April 18, two roadside bombs exploded in the Gaza Strip. Neither of the IEDs planted by Salafi jihadists opposed to Hamas rule in the enclave caused serious damage, but both explosions targeted United Nations Relief and Works Agency for Palestine (UNRWA) facilities. While the incidents were widely reported, there has been little questioning of why UNRWA buildings were targeted by those opposing Hamas. The logical conclusion is that in the eyes of those who planted the devices Hamas and UNRWA are identified as cooperating entities. Back in 2004, confirmation of UNRWA's relationship with Hamas came from the very highest level when the U.N. organization's long-time Commissioner-General, Peter Hansen, told the Canadian Broadcasting Corporation, "I am sure that there are Hamas members on the UNRWA payroll and I don't see that as a crime." Hansen left his post soon after. According to its critics, UNRWA allows the Palestinian Authority and Hamas to dictate what will be taught in UNRWA schools, including incitement against the State of Israel, the aspiration to martyrdom, and the demonization of Jews. Hamas is alleged to control the UNRWA teaching staff union and through those teachers, feed young and impressionable minds a diet of anti-Israeli and anti-Semitic indoctrination. UNRWA vehemently denies this charge. 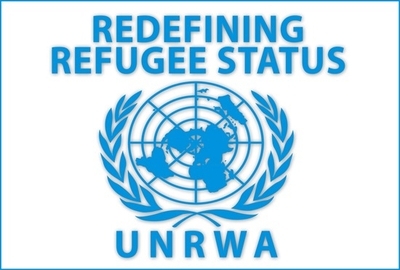 At its inception in 1950, UNRWA's definition of a Palestine refugee was crystal clear, including someone whose "normal place of residence was Palestine during the period 1 June 1946 to 15 May 1948 and who lost both home and means of livelihood as a result of the 1948 conflict." Depending on whose figures one accepts, between 600,000-700,000 former residents of British mandated Palestine left their homes in that period. That's about the same number of Jews who were forced to leave neighboring Arab lands and move to Israel as their lives became untenable in their long established countries of residence. According to the Center for Near East Policy Studies' 2011 report 'The Palestine Papers and the Right of Return' UNRWA soon expanded the definition of a Palestine refugee to include "descendants of refugees." Under that definition, there are around 5.2 million Palestinian refugees spread across Gaza, the West Bank, Jordan, Lebanon and Syria, around eight times the original number who left Palestine 67 years ago. UNRWA supports a Palestinian "right of return," meaning any or all of those 5.2 million people should have the right to move into Israel. That result would create a demographic avalanche which would end Israel's existence as a Jewish homeland. "According to the UNHCR [United Nations High Commission for Refugees, UNRWA's parent organization], you lose your refugee status if you become a citizen of another country," David Roet, Israel's deputy UN ambassador, said in a speech to the UN last week. "But in the Palestinian case, this restriction does not apply. UNRWA – and UNRWA alone – allows refugees to pass their refugee status to their children and now grandchildren." UNRWA employs more than 10,000 people in Gaza, Roet added. "Where were they when Hamas stockpiled thousands of rockets, many of them in close vicinity to UNRWR facilities? It seems that while they are quick to condemn Israel, when it comes to reporting on Hamas, UNRWA's employees become blind, deaf, and mute." In UNRWA schools, "Palestinian children are taught that the only solution to their plight is the so-called 'claim of return.' Many UNRWA facilities are decorated with keys symbolizing this claim of return. Young children are taught that these keys will one day open doors for them - but in truth these keys have them locked in a distorted reality. The 'claim of return,' make no mistake, is a euphemism for the destruction of the State of Israel." Roet's comments came amid UN events marking UNRWA's 65th anniversary and were in response to UNRWA Commissioner-General Pierre Krahenbuhl's assertion that Palestinians in Gaza and elsewhere in the Middle East "face an existential crisis on many fronts." Yet UNRWA appears to allow the Palestinian Authority and Hamas to dictate what will be taught in its schools even though, as a supposedly apolitical body, it holds veto power over classroom instruction. Two years ago, following the release of the documentary "Camp Jihad: Inside UNRWA Summer Camp Season 2013," which showed apparent indoctrination of Palestinian schoolchildren in some of its schools, UNRWA spokesman Chris Gunness robustly denied his agency cedes educational control to Hamas and said the schools "teach human rights and conflict resolution and have done so since the 2003 academic year." UNRWA reiterated the claim in its most recent budget: "UNRWA is therefore committed to... acting to eliminate violence in schools, taking steps to prevent gender-based violence and abuse of children, and promoting knowledge of individual rights through long-term human rights and tolerance programming in its schools." But in a damning two-part critique of UNRWA published last August and September, Lt. Col. (ret.) Jonathan Halevi, an expert on radical Islam, reported that in every school, including those run by UNRWA, there is a Hamas appointed representative who, "serves as a liaison for the group and is responsible for enlisting the students to the 'Islamic Bloc' and for organizing activities in the school and after school hours." The Islamic Bloc, according to Halevi, is "the official wing of Hamas, which operates in the educational institutions in the Gaza Strip (and in the West Bank), starting from elementary schools, junior high schools (including the management of UNRWA) as well as in high schools, colleges and universities." Islamic Bloc activities "are an important means for Hamas to carry out indoctrination of the younger generation, both in state-run schools and in UNRWA schools in the Gaza Strip, paving the way for the recruitment of the students to the ranks of Hamas and eventually to the Al-Qassam Brigades," Halevi reports. There was a period when the content of books taught in UNRWA and Palestinian schools did improve and was less inflammatory, said Arnon Groiss, an independent researcher and assistant to the Israel Broadcasting Authority's director general of Arabic radio and television. But, he added, the situation deteriorated again once Hamas came to power in Gaza in 2006. Incitement against Israel and Jews remains present in Palestinian schoolbooks published as recently as 2013-14, Groiss said in an interview for this story. "There is a chart," Groiss said, "in which you find the Palestinians of the West Bank, Gaza, and the [Palestinian] Diaspora in the year 1999, but there are no Jews. Six million Jews are missing! In the text as well the Levant is a region that includes Palestine, Jordan, Egypt, Syria and Lebanon, [not Israel]. The Jews have no holy places in the country; the Western Wall, for example, is an Islamic site. Israel and the Jews are demonized as having genocidal intentions towards Palestinians." "I counted about 35 accusations against Israel and the Jews in Palestinian schoolbooks," Groiss said, "and the right of return is also heavily advocated in the books." Even UNRWA's fiercest critics accept the need for an international refugee agency to deal with the many complex and politically sensitive issues connected to assisting Palestinians in Gaza and elsewhere. Many also believe that after 65 years, UNRWA should undergo a thorough review of its finances and its relationships – whether they be by choice or necessity - with designated terrorist organizations such as Hamas. Finally, its perceived lack of impartiality vis-a-vis the ongoing tensions between Israel and Gaza that have led to three bloody and violent military encounters in the last six years must be addressed. I read long ago in a reputable report that 95% of UNRWA in Azza (Gaza) are Hamas members. So, UNRWA, in reality, is Hamas. The 600-700,000 -person refugee figure was always absurd. Firstly, many Arabs left not because of the war, but to cause the war. They left at the behest of surrounding countries and at the behest of their own leaders west of the Jordan River. They were told that they'd return after the surrounding genocidal Arab countries annihilated the Jews. There are preserved recordings of some of these calls as well as some in writing. Secondly, the number itself isn't serious since it would seem to me to be including those who chose to become Israeli citizens.